It is a tiny world when it wants to be. Just twelve people, as they say, with the rest filled in with mirrors. I’d just finished my morning coffee and computer-parts run at the little shopping area on Memorial Drive in Cambridge (Our Fair City) when, just backing up my car out of my parking space, an older gentleman flagged me down. He had locked himself out of his car, he told me, and asked me if I would drive him to a gas station to get help. Which I did. On the way we talked, and first he told me that being 80 was tough, which, when I told him I knew, he responded that I had no idea, which is true. Then we just chatted a bit, and it came up that he had lived in LA for a while, had something to do with show business, and had just called an old buddy on hearing of Michael Jackson’s death. Then he told me this story: Back in the early sixties– 1964, I think he said — he had been involved in running something called the Carousel Theater in Framingham, MA. He and his partners had booked Diana Ross and the Supremes for a show, and had brought in the Jackson Family as the opening act. Michael was five at the time, and for most of his siblings’ performance he sat with his parents in the audience. Then, just as the Jacksons were wrapping up, his parents let him go, and he ran down to the stage and did his number — singing in that high, kids voice and dancing as he always could. It brought down the house, said my passenger. And after the headliners had gone on and come off, Diana Ross herself came back to the manager’s office. “I’m never going on after that kid again” she said — or so my new friend told me. I believe it; or rather, it has all the attributes of story that could be true. We got to the gas station in a few minutes — time enough for me to hear about the risk my friend had taken when he laid down $25,000 to bring the Beatles to Suffolk Downs in 1966. McCartney, he said, was very nice, a real pleasure to meet, unlike some of the other rockers he had known. Was all this for real? I don’t know. I think so; the dates match up, and I hadn’t prompted him on any of this. He told me his name, but I didn’t write it down soon enough, so there you have it: a chance met stranger, an old man with a story to tell…which I’ve now told you. 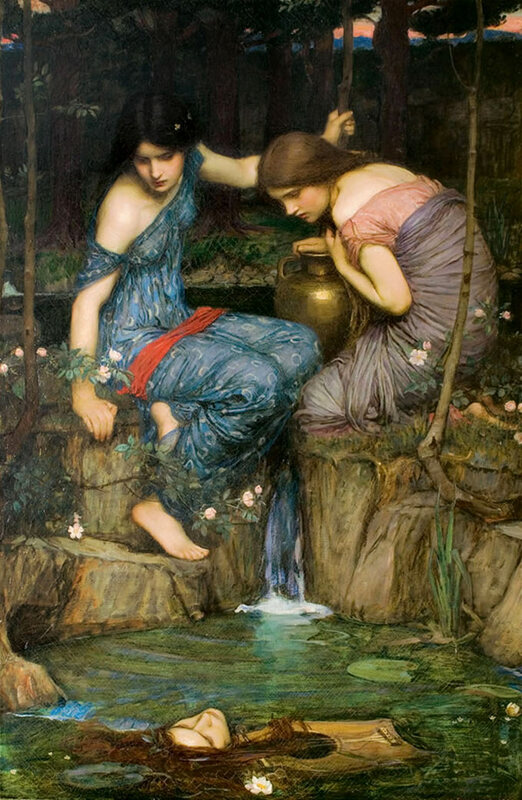 Image: John William Waterhouse “Nymphs finding the head of Orpheus,” 1900. This entry was posted on June 26, 2009 at 4:40 pm and is filed under Music, pop culture. You can subscribe via RSS 2.0 feed to this post's comments. You can comment below, or link to this permanent URL from your own site.